What is it about Mothering Sunday that has often left me feeling disappointed and unloved, and basically just a bit sad? Chatting with my own mum today, and friends it seems quite a universal feeling. We seem to have been encouraged, (maybe by the media) to look forward to a Sunday where your children will wake up early and if not bring you breakfast in bed, then at least a cup of tea. Then there are cards, hand made or if bought, then hand written, full of words declaring gratitude and praise. 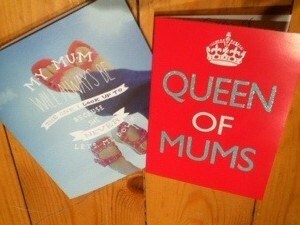 Maybe even gifts too, after all, the shops have been full of ideas of ‘gifts for mum’ since Christmas. I shouldn’t be feeling sad at all, I have lovely polite sons who did actually buy me two perfect cards and added a personal message. My step son regularly gives me little gifts of things he’s made at school, and I don’t expect anything from him on Mothers Day. I do however spend several weeks before hand reminding him to budget his pocket money so he can buy something nice for his mum, and encourage him to make her a nice card. Over the years I have had to give what I thought were quite clear instructions on what is appropriate behaviour to make their mum happy. It isn’t expensive either, the cup of tea, maybe a quick whizz around the garden picking daffodils and a thoughtful card. Afterall, who has children that still have any pocket money left at the end of the month? Then as Mothering Sunday always falls during Lent, surely that is not fair? If ever there was a day when you could do with a drink or a whole box of chocolates, this is it! When I was a single mum I would take my sons to church. That was guaranteed to make any mum fill with pride and relief as their toddlers were presented with posies to give to their mums.I also used to take them into the Post Office,(which has lovely cards) give them some cash and say ‘Buy me a nice card please’. When I met my second husband our first Mothering Sunday was a bit of a disaster. He isn’t a church goer, and Mothering Sunday coincided with my boys wanting to join the weekly Sunday morning Rugby club. I remember standing in a very cold and wind exposed muddy field, alone, with a smattering of enthusiastic Dads whilst my new man had a lie in. Luckily the drizzle masked my disappointment. That was the last time my sons played Rugby out of school! I came home, did laundry and cooked a roast. No flowers, cards or cups of tea. I had presumed that someone else would take control and guide the boys on how to spoil their mum on this special day. I gave hubby No. 2 strict instructions on how Mothers Day should run. These instructions were based on my upbringing. My brother and I were reminded by our Dad to make a card, pick flowers and as we got older buy a gift or chocolates. As I became independent, Mothers Day was a day that I always kept clear, to spend with my mum, and earlier with her mum too. A pub lunch, or I would cook. My mum would often host too and I hope that I always made her feel special and appreciated. I would also involve my former mother in law, a mother of sons, and a great granny to mine, including my stepson. I have felt guilty for most of toady for not having seen her, and only sent a card, yet technically she’s not my responsibility! Over the years I have noticed that many sons ‘don’t do Mothering Sunday’, with excuses like, ‘She knows how I feel about her’, & ‘She doesn’t like a fuss’. What rubbish is that? Of course she wants a fuss! This is the woman who sacrificed a good portion of her life bringing you up, and hasn’t stopped worrying about you since the moment you were born. She sincerely hopes that you think about her and may deep down know that you care, but she still needs to be told, and hopefully once a year isn’t too much to ask. In these days of Facebook, we’re bombarded with posts sharing how proud we are of our offsprings Mothering Sunday offerings, but are they really a testament to our mothering skills, or the organisation skills of their father or your partner? Then there are the all too common ‘poor me’ posts of forgotten mothers,( usually of sons) or snubbed mothers in law. They certainly make you think twice about bragging about how wonderful your own children have been. Despite this it doesn’t feel right to be ungrateful for any, no matter how small, token that you do receive. After much thought I’ve come to the conclusion that we want is that any thought to have come from our children, not an expensive gift Daddy chose , paid for & wrapped up. This is the day when a hand painted piece of cardboard with ‘I love you mummy’ and a flowering weed freshly picked, are perfect. This year I had many thoughts for the increasing number of friends who have recently lost their mothers. That has really helped me to appreciate my wonderful mother all the more. 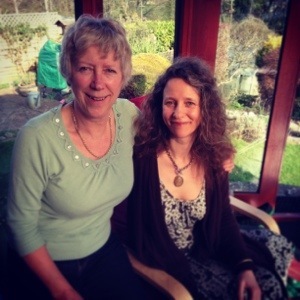 She has been my best friend for as long as I can remember, ( ignoring a blip during my teenage years) and so today my highlight was sat on her lawn, together on a picnic rug just ‘being’ together. Hopefully we will still have a good many years together, and I think that next year, she shouldn’t be cooking, I shouldn’t be expecting my sons to behave like daughters, Mum and I should go somewhere nice, just the two of us. Maybe the seaside or a beautiful garden. We can be served tea by someone else’s offspring, who will do so politely, and ask us if we’re having a lovely day. We’ll return home to clean and tidy houses, long soaks in baths and feel contented and loved. Ready for the next Monday morning of full on selfless mothering! Did enjoy your blog and really enjoyed my time with you and your very thoughtful presents [and the boys’]. You’re right maybe we do expect too much and perhaps we should spoil ourselves. There has been talk recently that it is not Mother’s day but mothering Sunday when traditionally the whole family visited the ‘mother’ church. Perhaps we have been led astray!! Great reflection, thank you. It is of help in my thoughts about Mothering Sunday, having 2 boys in their teens who need a jolt still to say thank you mum to my wife. P.S. Sundays don’t figure in Lenten observance and never have! Every Sunday is a feast day not a fast day, if you add the days up from Ash Weds to Palm Sunday it is more than 40, take the Sundays away and you have 40 – so go ahead and enjoy all the chocolate and drink you want, its Sunday after all, the Sabbath, created for humanities well being not the other way round. Thanks Rev! I wish I’d known about the Sunday feast days many years ago, then again didn’t I do well with all those years of a whole Lent without chocolate or alcohol- not at the same time though! I always had great self discipline when motivated. The past six years I’ve been very grateful of having that self discipline as I’ve benefited from being ( commercial) chocolate & alcohol free permanently. I still have much compassion though for those who try and go without during Lent. This year’s Mothering Sunday was a lovely day and having cleansed myself last year by writing the above post I was able to relax and go with the flow! I was remembered, I wept, and I cooked a lunch for thirteen, including my mum, my sister in law and her mum too! Enjoyed your blog just as we enjoyed Sunday and appreciated all your hard work. Just waiting for boarding gate. Lovely quiet drive up in the sunshine.